Deb's Cup of Tea: Can We Go Out and Play? I just don't remember a spring as weird as this one. It was 88 on the 22nd. In fact, it was so humid in the house, I put on the air conditioning unit for the first time, just to remove some of the humidity. On the 24th, it was 42 with freeze warnings for low lying areas away from Lake Michigan. Freeze warnings. I put the heat back on in the evening of the 24th because, when I came home from work, it was 65 in the house. That's chilly. I remember the cold, rainy, gray day when my youngest brother married his first wife. It was a Memorial Day weekend many years ago. Carole and I were headed back to the hotel at 10 p.m. from the reception. "Look mom!" she pointed excitedly. "Is that snow?" We stopped the car and got out to look. Indeed it was. The drizzle of a 45 degree day had turned into the snow showers of a 30 degree night. Hence, there is precedence for snow this late in May. Heck you might have heard about northern New York State getting 3 feet of snow over this past Memorial Day. Thirty-five degrees at night is not good for fledgling peppers, however. I brought them in the house on Friday and they sat by the back door where they could get sunshine all weekend. They went back out on Monday, when it finally warmed up to the low 70's. I lost another one of my seedlings but the two from the nursery are fine. They probably would have weathered the lows in the thirties but why take the chance. 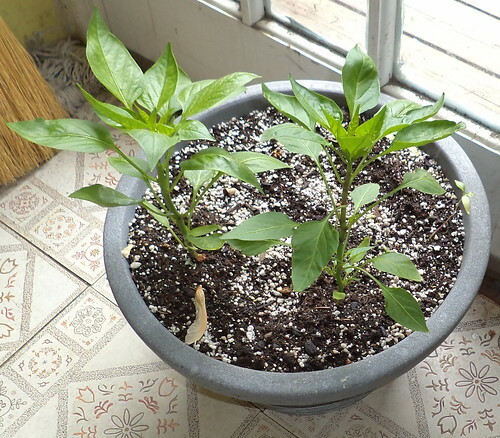 I want fresh peppers this summer. Still. I couldn't help anthropomorphize a bit about my peppers looking out the window at the other flowers on the deck. This might have been for their own good and survival, but it sure looked like they wanted to go back outside. I noticed last night, the chocolate pepper has a blossom on it already.